Leigh Anne Jasheway, M.P.H. (master of public healthmistress of public humor) is a stress management and humor expert who helps people manage stress, embrace change, and become healthier by learning to lighten up. She speaks at 30-40 conferences and workshops every year and is a member of the Association for Applied and Therapeutic Humor (AATH). She is the author of 24 books, including Don’t Get Mad, Get Funny; Not Guilty by Reason of Menopause; 101 Comedy Games for Children and Grown-Ups; Date Me, Date My Dog; and The Stressed Out Woman’s Guide to Letting Go with Laughter. She won the 2003 national Erma Bombeck Humor Writing Award for her true story on how her first mammogram caught on fire. 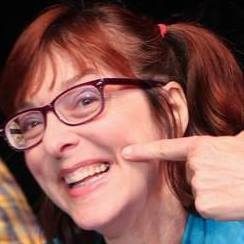 She teaches at both the University of Oregon and Lane Community College, is a humor columnist for the Register Guard’s Weekend and the former host of The Giggle Spot on All Comedy 1450 AM. You can get regular humor and stress management tips at Don’t Get Mad Get Funny on Facebook.